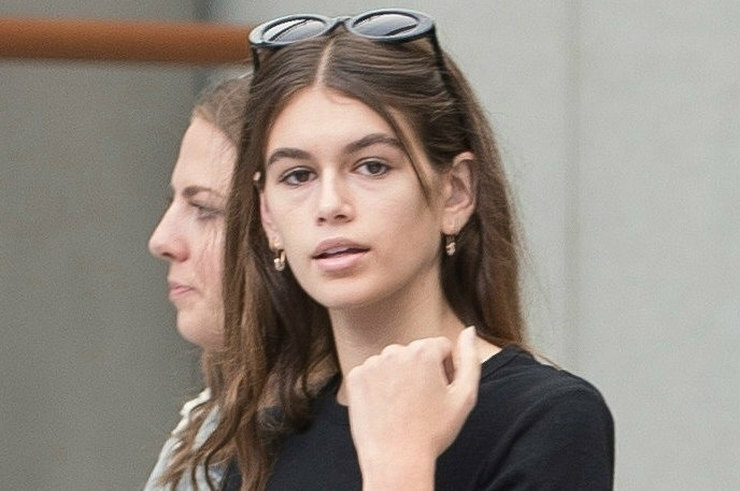 The 16-year-old daughter of Cindy Crawford Kaia Gerber suddenly became a star. However, the admirers of the young beauty are seriously concerned about her health. Since Kaia started modeling career, she has lost more weight. Are these fashion standards really right? Now the model is on holidays with her friends in Malibu and shares on Instagram rare photos in which she is seen posing in a bikini. In the photo, the girl looks so thin that it seems she is close to anorexia. Paparazzi managed to photograph Kaia in a break between shows in one of the parks in London. In the pictures, the beginning model is seen in ultra-short denim shorts and a turtleneck sleeveless shirt. Kaia looks not only painfully thin, but also very tired! Her face seems emaciated and bags are visible under her eyes. Web users were shocked by the latest photos of the girl and expressed their concerns about her health. Many believe, that Kaia does have eating disorder, and even anorexia! Now, bloggers ask Kaia's mother help her to stop losing weight. This year the daughter of supermodel Cindy Crawford, 16-year-old Kaya Gerber, became the most real discovery in the fashion world. Within the past weeks, Kaia debuted in the fashion shows of famous brands. oday the girl enjoys great popularity because of the phenomenal similarity with her famous mother. However, the public is worried about the appearance of Gerber. Recently she looks too thin. But a year ago she was much fuller. The network now and then get pictures in which the former blooming Gerber is not recognized: her face has become excessively thin and pale, lovely cheeks have disappeared, under her eyes appeared circles and bags. Today, Kaya's height 175 cm. she weighs only 45 kg. She does not comment on her sharp weight loss. Her fans suspect that the girl began to severely restrict herself in the food since she began to try herself in the modeling business. Many hope that Gerber will finally make up her mind and stop starving herself. Cindy herself always told her daughter that thinness is not the key to success in the fashion world.